What's the consensus on dry firing? Re: What's the consensus on dry firing? A good thread. Book marked but commenting to follow. I use the o ring. I have some snap caps but it is very clear how worn in the rubber part becomes from being struck by the firing pin. I do keep them around though for other practice (dead rounds and what not). Just like one would always check to make sure a gun is loaded before carrying, add the o ring check into your process. I rarely dry fire but when I first got my 75b I did a lot of it. The first thing that broke was my trigger return spring. I purchased the music wire trs from Cajun and felt I was good to go. But then I broke my trigger retainer pin and in the process my firing pin jammed. Off to CZ because nothing would release that firing pin. I got it back and immediately replaced the firing pin and firing pin retaining pin with Cajun's tool steel fp and their roll pin. Problem solved right? Uh no... additional dry firing broke my replacement trigger return spring! Ugh. So I ordered two Cajun music wire trigger return springs. Let's just say I go lightly on dry firing and if I plan to dry fire more than once, I use the o-ring. I was surprised the music wire trs broke that time. I guess it's possible there is a slight burr on my frame somewhere that shortened the life of mine but I have many rnds downrange since then and it's been fine. Have you tried calling David at Cajun Gun Works? This doesn't seem to be normal... I'd love to hear what David asks to trouble shoot and hear his feedback based on your specific pistol and circumstances. He and Scott are super good guys, they'll take care of you and then we all can be the wiser. I believe you are referring specifically to the music wire TRS breaking? Actually, no. I did not call them other than to order another one. I've spoken to one or both over the last two years on other issues. Once was for the stuck firing pin because I had already purchased and received their tool steel firing pin and the roll pin and I was trying to get the jammed one out. They were very helpful but both they and I concluded that sucker was STUCK! Later, when the TRS broke, although I was surprised, I called only to order two and said nothing about theirs breaking. Actually, that was out of character for me as I would usually question something like that since I was surprised but for whatever reason that day; rushed, distracted? I don't know, I just ordered the two springs. I sure was glad I had already installed their floating retaining pin though! So I take-it that this is out of the ordinary that it may warrant a all from me? It's been a couple of years since that one broke. Yeah, that's definitely not normal for their reduced power TRS to break. They likely will ask some questions to see if it was just a bad spring or something. They may ask about the inside of your trigger or something, who knows how they'll try and diagnose it, but I'm curious to hear. Plus I think you should feel free to dry fire and I'm curious if we can get a solution. I will call and let them know. I'll explain that this was a long time ago though. They might be able to direct me to look at the sections that come in contact with the TRS. While there has not been a problem since my last purchase and instal, I've avoided putting it to the test since two breakages trained me to not dry fire a lot. If I call today, I'll let you reply here on what they said. OK I called Cajun and spoke with Dave for a while. I explained about my to broken TRS's, one being their music wire TRS. Dave told me that they spent a great amount of time identifying the cause of the TRS's breaking. He told me that even though their music wire spring is superior to CZ's stock spring, it will eventually break as a result of dry firing in DA mode. This is because of heat build-up in the spring from DA dry firing. SA dry-fire trigger pulls will not build up heat in the spring; only repeat DA dry firing will. He said that they've never encountered a SA-only CZ with a broken TRS. Also, live fire will not break the spring since only the first shot in each magazine in in DA. Dave said that if you want to dry-fire using DA only, do it for a very limited amount of trigger pulls to avoid heat buildup in the spring. Additionally, if you decide to do so, have a spare spring not exposed to DA Dry-firing and swap it for CC, home defense or competition. I felt reassured that nothing is wrong with my particular 75B. I also am glad I instinctively discontinued dry firing after I broke my second spring. While most discussions regarding concerns of dry-firing focus on the firing pin and the firing pin retaining pin, the other hazard is breaking the trigger return spring. The use of an O-ring or snap caps will not prevent that. My suggestion is to limit DA dry firing and if you want to do prolonged dry firing, use the O-rings and dry fire in single action. That's very informative. Thanks for looking into it and reporting back. That is very informative! I dry fire a decent amount but my DA dry fire is in short segments. Might be why my RP-TRS has never failed. Thanks for calling and sharing! You're welcome! Thanks for the the suggestion to call. It was an unresolved mystery for me. Now resolved! I ended up talking to Dave about getting better sights too. haha... Stock sights not the best for my eyes. That topic is in a different thread. I find this interesting also as I sometimes will fire a whole mag in DA by decocking after each shot. I guess I won't be doing that anymore. When I bought my SP-01 from Cajun Gun Works, on the phone he recommended using the O-ring trick. I figured if they did the work to my gun, I should listen. As for forgetting it, I did and couldn't figure out why the gun wouldn't go bang at the range. Now I start and end each dry practice session putting the O-ring back in the container it came in. It doesn't have to be a precise size. David's explanation for the TRS failures being limited to multiple DA dry fire fatigue and heat is consistent with my experience. My 75B is SAO and has close to 50k rounds and some dry fire and I haven't had a TRS break yet. I may have replaced it once during the last six years, seems I launched and lost one some time ago, but no breaks and I am not concerned about it. Keep in mind that all it takes to create a stress riser in the spring is to nick it with some pliers while trying to assemble it. I guess the TRS could be shot peened to improve their fatigue life like I had to do in four valve Ford racing engine valve springs. A forum member was giving away excess O-rings the other month (can't remember who it was but thanks!). 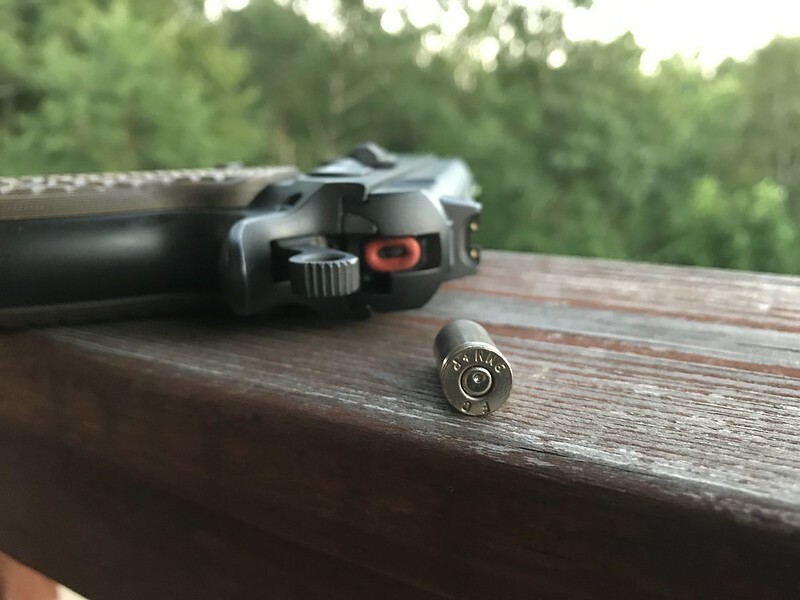 When I went to the range I forgot to remove the O-ring, which resulted in me pulling the DA trigger several times before I realized what had happened. That said, the firing pin did still move enough to dimple a cartridge primer (did not discharge). Should I be using a thicker O-ring, or is this still a good way to protect the firing pin?